Microsoft is a supercomputing wannabe, and with Windows HPC Server 2008 R2, the company will be coming at the Linux-dominated HPC community from a few oblique angles that play to Microsoft's - not the Linux community's - strengths. With the second beta of HPC Server 2008 R2, Microsoft is allowing for supercomputer clusters to tap into vast amounts of latent processing capacity in Windows 7 PCs, and it's allowing developers creating HPC applications to use the same Visual Studio that commercial developers employ. While the general purpose Windows Server 2008 R2 has been available since last fall, the update to the HPC variant of the stack is taking a little extra time. The first beta for HPC Server 2008 R2 came out in November 2009, at the SC09 supercomputer trade show, and was one of the hot items at the event. The main reasons was a funky hybrid of Windows 7 and HPC Server that allowed workbooks with complex algorithms embedded in them to have their processing dispatched and run in parallel on x64 server clusters running HPC Server, offering a massive speedup. There are some half billion Excel users in the world, and some 10 per cent of them are heavy users (quants, in the Wall Street lingo) that might benefit from using an HPC cluster as an Excel workbook co-processor. With the equivalent of many hundreds of thousands of lines of code in their workbook models, quants could see a factor of 25 to 100 performance improvement, depending on the nature of the workbooks and how much iron they throw at it. Vince Mendillo, who is senior director for the Server & Tools Business Group at Microsoft, says that this Excel accelerator feature will be called HPC Services for Excel 2010. Office 2010 will be available "shortly," but this cluster linking feature to accelerate Excel 2010 is not expected until the fall. Because it takes a little tweaking sometimes to allow user-defined functions embedded in workbooks to access an HPC cluster, Microsoft is partnering with systems integrators and consultants such as Wipro, Grid Dynamics, and Infusion to help customers build the HPC Server 2008 R2 clusters needed to goose Excel 2010 workbooks and in some cases to upgrade Excel workbooks to the new spreadsheet version. As you can see, Windows is only a smidgen behind on this test. Mendillo says that Windows meets and sometimes exceeds the performance of Linux clusters, but you'll notice Microsoft did not show an example where Windows beat Linux. Interestingly, Microsoft, says Mendillo, has thousands of organizations that have deployed HPC Server into production and nearly 100 independent software vendors in the supercomputer space that have ported their apps to run atop it. However, Microsoft knows it has to cooperate with Linux and that is why Microsoft has worked with Adaptive Computing to get its Moab Adaptive HPC Suite to be able to allocate jobs to Windows as well as Linux nodes in a cluster. 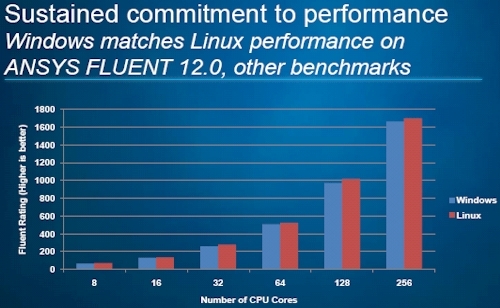 Ditto for Platform Computing's ISF Adaptive Cluster, which can allocate to both now, too. Clustercorp has tweaked its Rocks+ to do a hybrid dual-booting of servers so servers in the cluster can boot up either way as the jobs demand. Another interesting new feature with Windows HPC Server 2008 R2 Beta 2 is that it now has the ability to reach out to Windows 7 PCs on the network and sneak processor cycles - grid computing style - from those PCs. The new HPC Server R2 beta has administration tools that let system administrators gracefully shut down the HPC work running on the Windows 7 machines so end users have their machines when they need them to do work. This processor cycle theft will not be enabled on Windows XP or Windows Vista machines, so you'd better upgrade to Windows 7. Visual Studio 2010 comes out next week, and Microsoft's integrated development environment has hooks into the second beta of HPC Server 2008 R2 that will allow for application developers coding standard MPI applications or tweaking Excel workbooks to run in hybrid mode with an HPC cluster to work from within VisualStudio. Microsoft is also working with Nvidia and tapping its Parallel Nsight 1.0 parallel development environment for DirectX, OpenGL, OpenCL, and CUDA applications to allow HPC Server 2008 R2 to access the number-crunching power of Nvidia GPUs without having to use the CUDA programming tools from Nvidia.